This Friday my husband and I started decorating our home for Christmas. The tree is trimmed and I started bringing out my Christmas teapots. 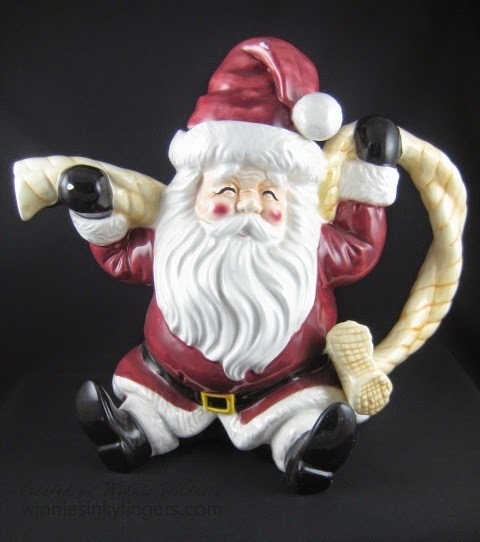 Today I am sharing my Santa teapot with you. He is just so jolly and always makes me smile. This weekend I started making Christmas cards for my friend Erich to give. He asked for a dozen cards and he tends to like the humorous or sweet cards. So the first one I made was this one. 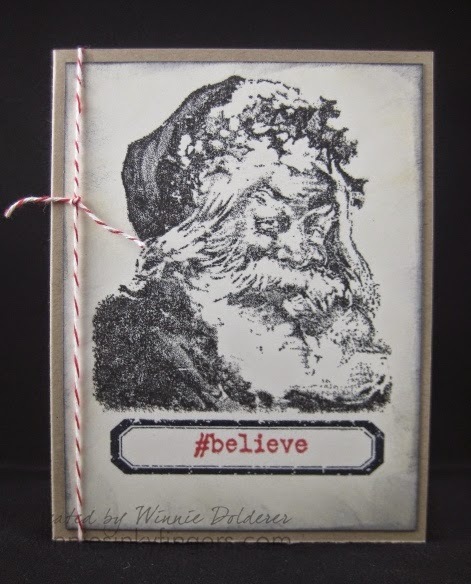 I used a favorite vintage Santa image and a fun stamp from the Hashtag Stampers Anonymous set I won. Hope you like it! How are you preparing for the holiday season? I am attending a Christmas party this weekend, and am hosting a cookie swap the following week! Lots of holiday cheer coming my way! Oh your Santa teapot is jolly! Love the card. Such a classic Santa. I started decorating on Sunday. Tree is up. Just a few more baskets of greens to go and our house will be all festive. What a beautiful vintage style Christmas card. Old St. Nick never looked better. I'm behind on my decorating this year, but I'm not worried...it will get done. I hope your holidays are the best ever! I love your Santa teapot! I don't think I've seen one like him before and that's a lovely vintage card. Lucky you to be all done with your decorating. Hopefully, we'll be done with ours today or tomorrow. I adore your Santa teapot! So festive! Especially for a St. Nicholas tea on the 6th! As far as frosted cookies . . . I did 400 of them yesterday -- frosted AND sprinkled for the Homes Tour here! A labor of love! Love your Santa teapot! So cute! Am just starting to decorate. Have a great week! Those are both beautiful, Winnie. We already decorated our mantle and put up our tree. I'll be baking now and then until the 24th, and running around with friends and family to look at Christmas lights in the neighborhood. Your teapot is really cute and jolly, Winnie! How nice to make your own cards. Thanks for joining me for tea and enjoy your day. Your Santa tea pot is simply so jolly! Adorable!